cyberREN charting is carried out at mobile / wireless workplaces near the bedside, 1 workplace for each caregiver on shift. Based on the hemodialysis schedule, a guide can be printed automatically before the shift for each patient, serving as a worksheet for the caregivers. A comprehensive, rigorous chart with a number of required data entry fields ensures a complete and legible treatment record every time. Session charting is accomplished in 3 simple phases, pre-dialysis, intra-dialysis and post-dialysis charting. Total charting time is less than 6 minutes per session. Most of the charting is automated. 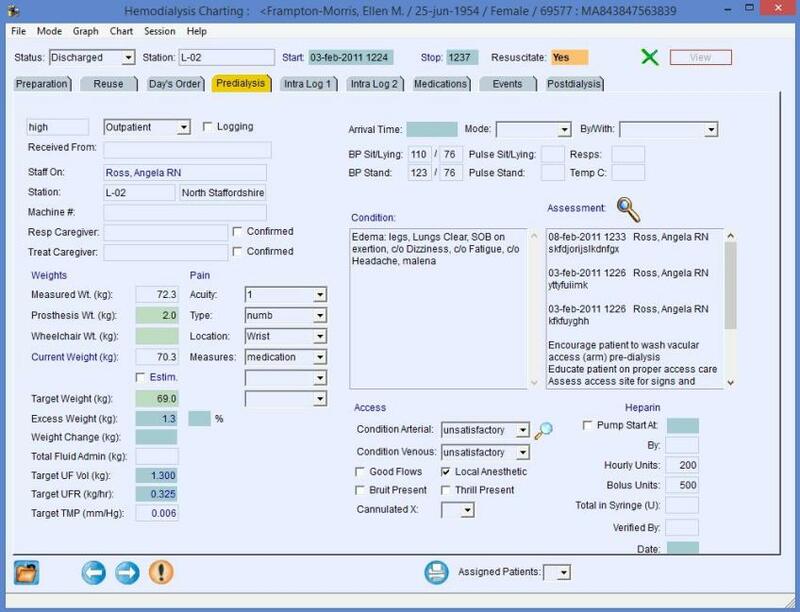 On the Intradialysis Charting Display, both treatment data imported automatically from the dialysis machine, as well as medications given to the patient are shown in a chronological record for easy review. All data received from the dialysis machine must be acknowledged by the treatment caregiver. Treatment guidelines come from a Hemodialysis Prescription, which is valid over a longer date range. Short--term changes may be made on a per treatment basis, i.e. are not necessarily carried forward. Alerts are displayed automatically in a dedicated window and include all orders to completed during the session, patient appointments and reminders as well as a caregiver notes that were left from the last session. Treatment data from the dialysis machine is automatically captured and logged with every blood pressure measurement, or at least every twenty minutes. All alarms occurring at the dialysis machine are logged as well, for later statistical analysis. Medications given are charted intra-dialysis. All medications must be charted before session can be closed, for complete billing capture. Only cyberREN users of the "nurse" discipline may chart medications administered, and only a nurse may later close a session record. A history of all dialysis treatment is kept for each patient, with all detail regarding each treatment being available to caregivers at any time.